I currently have at least one of each of the Kenner Building sets numbered from 1 to 33. Playing with them makes me feel like a 10 year old kid again. 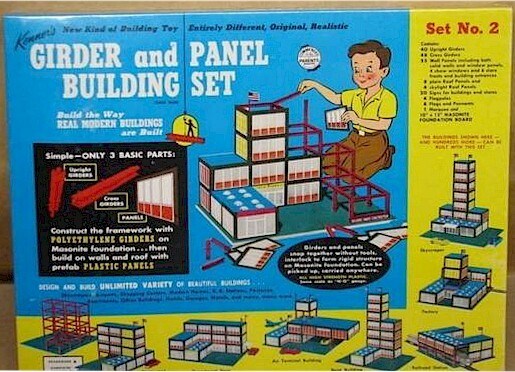 I still have all 3 of my Girder and Panel sets. I used to love my sets of these. I had one of these... Actually, between me and my three older brothers, we had several different sets that we often combined to make little cities... One with road segments was called "Girders & Turnpikes, etc. I got this set for christmas of 1957 and it was the best building set that I ever had - a lot better than the plastic/cement building block sets.